Real Men Don’t Eat Quiche or Paint Flowers! Or Do They? When we bought our nearly 200 year old house in downtown Camden, ME, along with it came my own little Giverny. Like Monet (but on a much smaller scale) I found myself surrounded by beautiful gardens and blooming trees. I would look out the front window (my studio) and see the daffodils in the spring along with pink and white peonies standing tall against our white picket fence. The peonies were so beautiful, one time I looked out and a lady that lived up the street felt the urge to cut an entire bouquet for herself to take home and enjoy! It was premeditated as she had her scissors in hand. Occasionally, I would take a coffee break from painting and wander downstairs into our living room to gaze through the picture window. It was one of my favorite views in the house. Colorful tall Hollyhocks would catch my peripheral vision as I took in the annual beds on either side of the old stone steps that lead down to our greenhouse and our perennial beds. Beyond were two church steeples that for me made the view serene. On some of these occasions, I would see our 6 foot tall gardener and friend Anna in the middle of the perennial bed with her arms in motion and seemingly talking to herself. I would always laugh when I realized that she was talking to my 5 foot tall wife Jen, who couldn’t be seen among the phlox. Other times, I would see tourists meandering down our driveway to take pictures of the perennial flowers in bloom, continuing on into the yard like they lived there. Surrounded by hostas, daylilies, beds of impatiens, rose bushes, extensive perennial beds, purple lilac trees etc… I guess it was only a matter of time before I started painting flowers. One day we were at a good friend’s house and I noticed a beautiful floral still life print on her wall. When I examined it closer I was surprised to see that it was a Renoir! I wasn’t aware of Renoir’s magnificent floral still-lifes. Renoir must have been inspired on his frequent visits to his good friend Claude Monet’s house, Giverny, for he produced some of the most spectacular florals that I’ve ever seen. I was so inspired that I called up Anna and asked her to put her creative genius to work to create a floral arrangement for me to paint. Next thing I knew I was painting flowers! Being a very slow painter, I quickly realized I had a limited time before all of the flowers shriveled up. I chose a 30” by 40” inch board to give the piece some grandeur. Between the short lived life of cut flowers and the sizeable scale of the board, it created an hour glass effect. I took photos for backup but I sketched and painted as fast as I could in order to work from real life three-dimensional flowers and not two dimensional photographs. 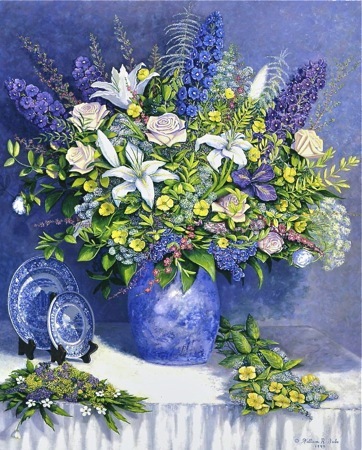 It was my first floral still-life. It was inspired by Renoir, created by Anna and a joy to paint. We ended up buying a print of Auguste-Pierre Renoir’s floral entitled, Spring Bouquet, and it hangs in our guest bedroom. Seeing his masterpiece daily, makes me want to try again for even though I’m happy with the painting, I know I can do better! So if you must, call me a quiche eating artist who paints flowers. It sounds like a great way to spend a day! Positive ART That Lifts The Spirit!